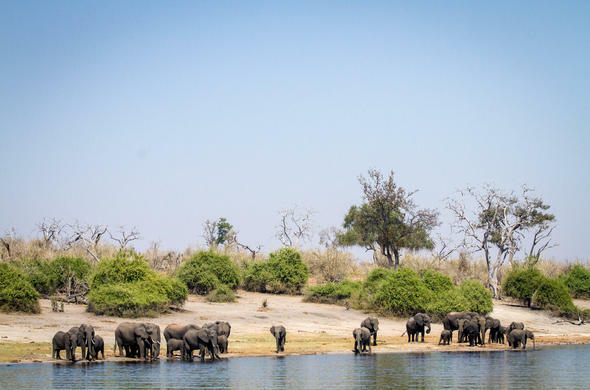 This 5 Day Classic Follow Chobe Elephants Safari Package is the ideal introduction to the splendours of the African bush. This region of Africa has always been known for its many Elephants and our Chobe safari package allows you to learn about the behaviour of these gentle giants. 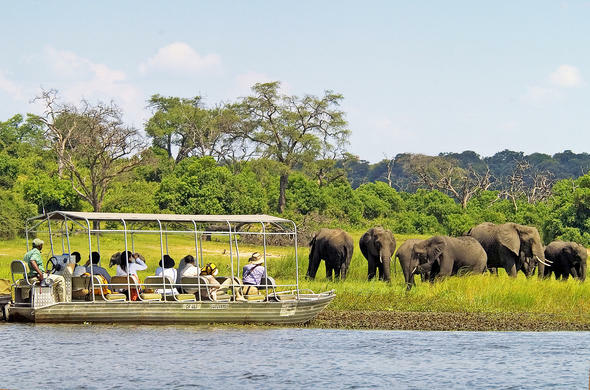 This Chobe tour starts in Victoria Falls in Zimbabwe, where you will ride the Elephants and see the bush and wildlife from their perspective. Then take in the mesmerising beauty of the Victoria Falls before going on to the Chobe National Park where you will be able to see lots of Elephants in their natural habitat. See all the amazing wildlife of the Chobe National Park such as Wild Dogs, Lion, Leopard and plentiful plains game while on exciting game drives. Go on tranquil sunset cruises on the Chobe River and sip on delicious drinks while watching the sky change colours with the sunset. Stay in comfortable accommodation and savour delicious safari inspired meals. Drift off to the sounds of the African night. On the first morning of our Follow Chobe Elephants safari package you will catch a morning flight from Johannesburg O.R. Tambo International Airport to Victoria Falls Airport in Zimbabwe. After clearing immigration, you will travel to the lodge which is situated outside the town. There will be some time to settle into your luxury tented suite before a light lunch. If you are an adrenaline junkie, why not arrange to go on (optional activities) such as the Gorge swing, go abseiling, bungee jumping off the Victoria Falls Bridge or white water rafting. 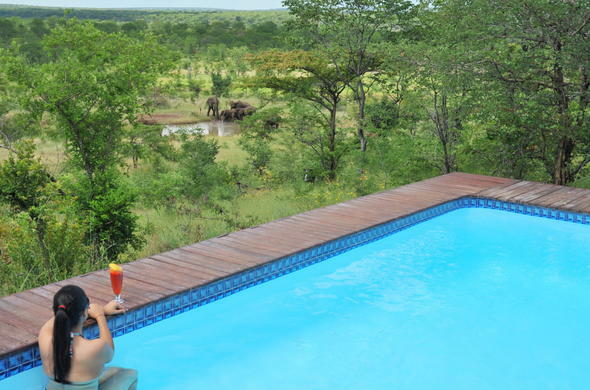 Alternatively spend the afternoon relaxing poolside with some cocktails watching passing by African wildlife. Head out and explore the Victoria Falls National Park and see the mighty Victoria Falls from the Zimbabwean side. It is known locally as Mosi-oa-tunya, meaning "the smoke that thunders". Visit the local craft market and see beautiful Zimbabwean stone carvings and bead work - perhaps purchase a memento of your trip. 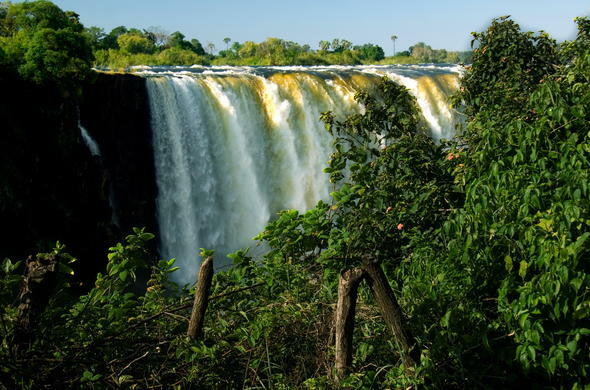 Spend some time exploring Victoria Falls town before your guided tour of the waterfalls. In the afternoon have a memorable encounter with a group of habituated Elephants. Go on an Elephant Back Safari through the bush and let the guides tell you about their natural behaviour. Returning to a platform, there will then be an opportunity to feed the Elephants and learn more about their behaviour. In the evening the camp lays on a delicious dinner. Drift off to sleep listening to the sounds of the African night. Today you will leave the camp after breakfast and be driven to the Chobe National Park, crossing the border from Zimbabwe into Botswana, arriving in time for lunch. There will be some time to settle into your suite before the afternoon game viewing activity. This may be a game drive in search of the Chobe Elephants or a tranquil sunset river cruise. In the evening savour a sumptuous buffet spread.There will be an early wake-up call in the morning, followed by a cup of tea or coffee before heading out on a game drive in search of Wild Dog and the Big Five. The excursion will be led by a knowledgeable and enthusiastic guide. Upon returning to the lodge tuck into a delicious brunch. In the evening go on a sunset river cruise followed by dinner in the traditional boma and enjoy traditional marimba music, singing and dancing. There will be time for one last game drive before breakfast. You will then be driven back to the Victoria Falls Airport, re-crossing the border between Botswana and Zimbabwe. At the Victoria Falls Airport you'll catch a scheduled flight back to Johannesburg's O.R. Tambo International Airport. 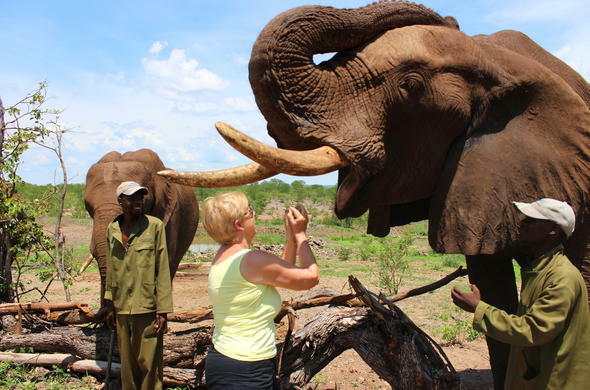 This Follow Elephants Safari Package is ideal for a couple staying on a per person sharing basis and includes flights to/from Johannesburg and a complimentary Elephant interaction experience. Rates may vary depending on the season and daily currency exchange rate.